Way back in June at WWDC 2011 Apple announced their most advanced and innovative iOS 5 which is yet to come for public. One of the innovative thing Apple made is iOS 5 was iMessage which allows iPod/iPad/iPhone users to send each other messages and multimedia messages over WIFI/3G with real time delivery reports and real time typing indication. This feature might be new to some people and most of them would be aware of this type of feature which is already present in BlackBerry with the name of BlackBerry Messenger. But BlackBerry Messenger only allows people to send free SMS to other BlackBerry friends and users. Like BlackBerry Messenger, with iMessage you cannot send any non iOS Device SMS/MMS, this was also confirmed by Apple. You cannot send SMS/MMS to your MAC OS X iChat also. Few days back Apple released MAC OS X Lion 10.7.2 (11C55) for Developers. Like always when something is released to developers they start to dig in the build to find some bugs, but this time a Developer found something strange in the code of MAC OS X Lion Build (11C55). He found some evidence of iMessgae and iChat integration in MAC OS X Lion by Apple. Buried in the framework of OS X Lion’s iChat, are two new properties – The “timeDelivered” and “timeRead’ fields that indicate the tracking of delivery and read receipts for instant messages. These features, however, are not supported in any of iChat’s native messaging protocols, while the same features are offered in Apple’s iMessage protocol. These properties were also not present in previous versions of iChat prior to OS X Lion. If iMessage is integrated into iChat in MAC OS X Lion, so it would be really convenient for iOS 5 users and MAC OS X users to communicate with each other via iMessage. This wouldn’t be the first time when Apple will integrate something into iOS and MAC OS X. First Apple integrated Face Time in iOS and then released Face Time for MAC OS X via MAC AppStore in February. iMessage for iOS is not yet released and it is in Beta stages. The release is said to be in fall and the wait will be over soon for iOS 5 and iMessage. 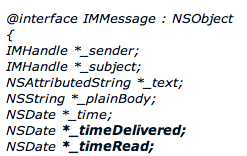 Till now no words have been said by Apple about the integration of iMessage in iChat for MAC OS X Lion, but after this hint of source code, it seems that the work has started and integration might come after the iMessage is public.